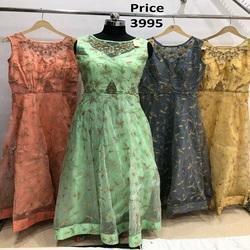 Wedding & Party wear Kurtis, Buy from the latest collection of Party & Wedding wear Kurti Online. 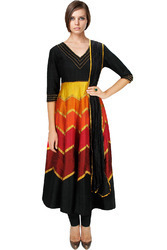 Shop for elegant & Stylish Party and Wedding Wear Kurti from top Premium Quality. Embroidery work on top with collar neck present in cotton fabric with dark blue color.dark purple and orange dupatta in chiffon. Color- dark purple and orange. Pattern- upper side embroidery work. Designer Embroidery Salwar Suit is offered by us to clients in wide range. 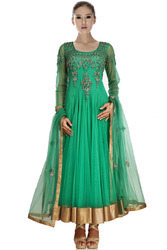 The offered Designer Embroidery Salwar Suit is available in different colors and designs. We manufactured this Designer Embroidery Salwar Suit as per the latest fashions and trends. We are the leading supplier of this Designer Embroidery Salwar Suit. We also customized this Designer Embroidery Salwar Suit for clients as per their requirements. Embroidery Designer Suits is offered by us to clients in wide range.The offered Embroidery Designer Suits is available in different colors and designs. We manufactured this Embroider Designer Suits as per the latest fashions and trends.Embroidery work on the bottom part of suit with combination of blue and dark purple. color - dark purple and yellow. Designer Salwar suits is offered by us to clients in wide range. The offered Designer Salwar suits is available in different colors and designs. We manufactured this Designer Salwar suits as per the latest fashions and trends. We are the leading supplier of this Designer Salwar suits. We also customized this Designer Salwar suits for clients as per their requirements. 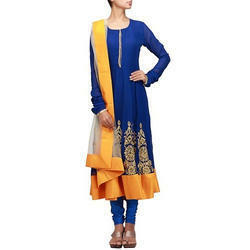 Designer Salwar suit is offered by us to clients in wide range. 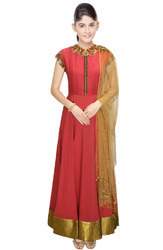 The offered Designer Salwar suit is available in different colors and designs. We manufactured this Designer Salwar suit as per the latest fashions and trends. 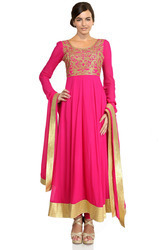 We are the leading supplier of this Designer Salwar suit . We also customized this Designer Salwar suit for clients as per their requirements. We are the manufacturer and exporter of Salwar Kameez Suit . Designer Suits is offered by us to clients in wide range. The offered Designer Suits is available in different colors and designs. We manufactured this Designer Suits as per the latest fashions and trends. We are the leading supplier of the Designer Suits. We also customized this Designer Suits for clients as per their requirements. Printed salwar kameez with dark blue and red dolor combination offerd by us to the client. We manufacture printed suit in difrent colors and designs.We also customized this salwar kameez as per the client requirement. 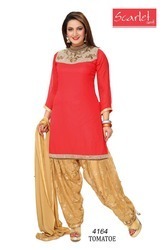 We are the manufacturer and exporter of Salwar Kameez .